Located on the sparkling waterfront of Tanjung Benoa Beach, the Holiday Inn Resort® Bali Benoa offers cool, contemporary accommodation for families, couples and solo travellers. Less than 15 minutes’ drive from Ngurah Rai International Airport and five minutes from Nusa Dua, our bali beach resort is perfectly positioned for an action-packed holiday, while also offering plenty of opportunity to escape and unwind in paradise. The rooms at our Benoa family resort are sleek and modern, providing all the mod-cons sophisticated travellers expect, not to mention brightly themed kids’ rooms sure to surprise and delight our younger guests. At Holiday Inn Resort® Bali Benoa we offer beachfront activities, an exciting Kids Club, four pools, chilled-out lounge zones, free Wi-Fi and our signature Tea Tree Spa for optimum relaxation. Rev up with adrenaline-fuelled days or just laze by the pool and enjoy genuine Balinese hospitality, here on the Island of the Gods. Offering 35sqm of living space, each of these rooms at our Benoa beach resort offer king or twin bed accommodation with plush bedding and a selection of firm and soft pillows for a great night’s sleep. There’s a private balcony with outdoor seating where you can enjoy fresh seaside air, with block-out curtains and double-glazed doors ensuring maximum peace and serenity. Bathrooms are sleek and modern, with boutique bath amenities provided. For midnight snacks or breakfast in bed, room service is available ’round the clock. The spacious Benoa Suite creates the perfect environment for a pampering vacation at one of the island’s most enchanting Tanjung Benoa hotels. Measuring 46sqm, these suites feature a balcony with outdoor seating where you can relax with loved ones in comfort and privacy, modern bathroom with boutique amenities, and a walk-in closet with full-length mirrors and plenty of storage space. A mini home-away-from home – you may never want to leave. One King Bed. Unwind in a spacious 51 sqm suite with living area overlookng benoa beach and bay with multiple ocean views.39 inch LED TV and DVD player.Separate work area.Relaxon the lounge and refresh in the spacious bathroom with walkin shower. Max 3a or 2a 1c. Rollaway bed at an extra charge. With a generous 81sqm of space, each suite provides all family members with enough room to play, relax or work in peace. There are two separate rooms – a parent’s room with clean, contemporary décor and a colorful, themed kids’ room with twin beds, kids’ linen and a PS4. There’s even a dedicated kids’ bathroom with a bathtub and special children’s amenities. Adults have their own separate bathroom with boutique bath products and there’s a spacious lounge area with sofa seating. A private balcony with outdoor seating provides another space for relaxation and repose. It’s the perfect family base for an action-packed Bali holiday. 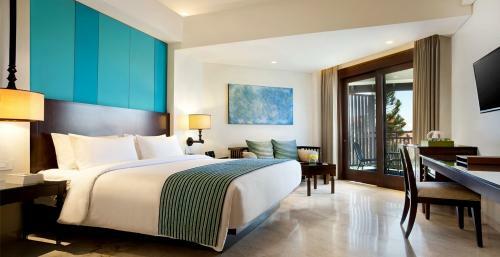 Immerse yourself in Balinese bliss with the Grand Benoa Ocean View Suite, measuring a generous 102sqm. Showcasing 180-degree views across Benoa Bay from a private wrap-around balcony, this suite features beautiful Indonesian hardwood floors and high timber ceilings to create a luxurious atmosphere. The sleek marble bathroom features a walk-in shower and separate tub, while outdoor seating on the balcony allows travelers to make the most of their spectacular surrounds at what is considered one of the best beach resorts in Bali. Enjoy a welcome fresh fruit platter, welcome flowers and nightly turn-down service – all you need for the perfect Balinese retreat.